At the beginning of each school year, the children are told five “Great Stories,” which introduce them to the main concepts behind geography, biology, history, language, and mathematics. From there, guided by each child’s interests, the additional concepts are filled in through lessons and other smaller stories. What we present to the elementary child relies heavily on their vivid sense of imagination. We aim to spark interest in a child so that he may desire to learn more and follow their own interests. While a great deal of emphasis is placed on learning the basics of reading, spelling, and mathematics in the beginning of the Lower Elementary program, once a child can work independently in these areas, they are open to follow their own their own interests to truly form their own unique and individualized educational path. Geography covers space, Earth and the universe, the composition of Earth, the nature of the elements, the sun and its relationship with Earth, the work of air, the work of water, life on land, interdependencies, and economic geography. For each of these topics, we provide aids to the imagination in the form of stories, colorful, impressive charts, and a variety of experiments that have been selected to provide impressions. Biology begins with the introduction of the Timeline of Life, which illustrates how minute the lives of humans have been on this planet in regards to the rest of various organisms. Botany presentations include the needs of the plant and the functions of the vegetative and reproductive parts of the plants, among other topics. Zoology lessons introduce the child to different animals and their bodily functions, followed by the classification of animals and plants and the study of ecology. History in Montessori elementary includes most everything! Children learn how various groups of people worked, communicated, and explored. They also learn how the accomplishments and failures of different people were managed, and they admire the unknown heroes that have helped to make our lives what they are today. Language lessons include building upon the experiences that the child has already received in the Primary Program, a deep study of grammar and language expression, in addition to the rules and facts that exist in language, and using language to aid the child in their development of intellect and a moral sense. Further lessons include spelling, vocabulary, and etymology, and children are also encouraged to express themselves through various forms of writing including reports, fiction, and poetry. When a child first enters the Elementary Program, they may not be an independent reader. In such a case, much emphasis is placed on supporting that child to reach reading independence. Mathematics begins with sensorial activities, which leads to abstraction of mathematical concepts through imagination. Geometry, arithmetic, and algebra are presented simultaneously. Mathematic concepts naturally need to be repeated in order to be memorized, but in the Elementary Program, that repetition is provided through variety. 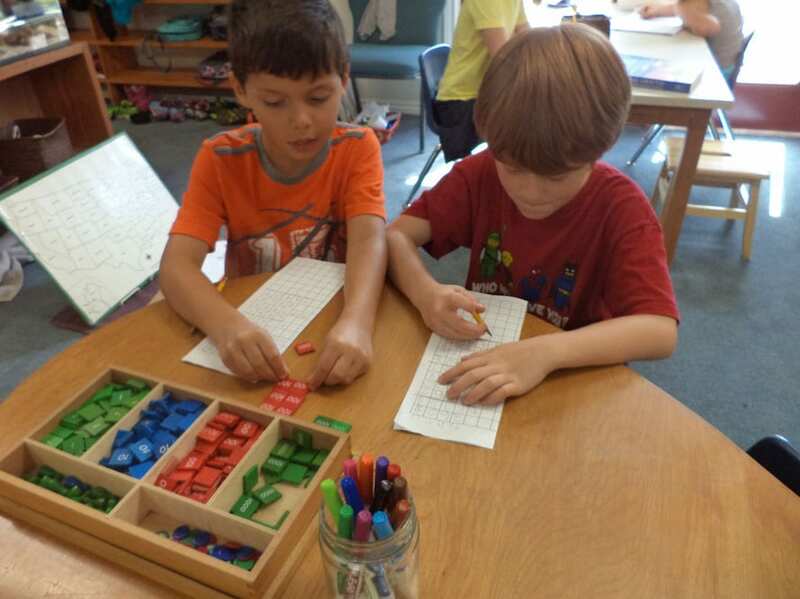 Children are able to choose their own math problems, and many materials lend themselves to group work. Social-Emotional – We respect and guide the whole child, socially and emotionally, as well as academically. Children of this age are constantly formulating what is “right” and “wrong” in addition to testing out various behaviors and friend groups to find a comfortable place in society and the world. We provide opportunities for children to grow in these areas by allowing them to work in small groups or with partners and providing freedom to work out problems or challenges that may arise with their friends quickly and in a safe environment. Artistic, musical, and creative endeavors are always being fostered and supported in the Elementary Program. The child is encouraged to not only freely explore their own artistic abilities, but to also apply the various learned techniques to lessons across the curriculum. An introduction to and appreciation of art history is explored as well, and music is a daily part of the classroom. Outdoor Play – We believe that the elementary child needs to move and be connected with the outdoors in order to truly be willing and able to focus in school. At Parkside, we provide ample opportunity for both. Flow of the Day – A typical day in Lower Elementary begins with some form of physical activity, either through free outdoor play, an organized hike, or other movement before the morning work period. After lunch and playground time, the afternoon usually consists of another work period, full-class lessons, show-and-share, or community meetings before community jobs and a read-aloud time to wind down at the end of the day. Spanish and guitar are additional enrichment programs that are integrated into the Montessori elementary curriculum.